One of the most important factors in warehouse efficiency–for both the owner and employees–is the physical layout of the warehouse itself. A poorly conceived set up and floor plan can lead to hours of backtracking and/or down time. Since every successful warehouse requires the use of forklifts, most of the layout considerations should be made with these vehicles in mind. 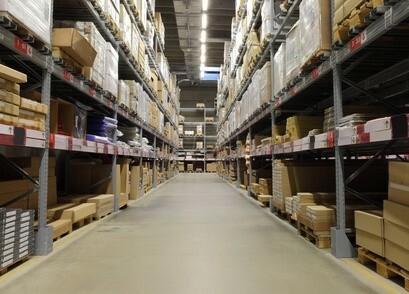 An often overlooked factor in warehouse efficiency is lighting. If indoor lighting is insufficient, multiple problems can arise. Smaller scale issues might include inventory and distribution delays due to difficulty in reading item numbers. Larger scale issues could be as serious as forklift collisions. Optimizing indoor lighting is an easy way to avoid a wide range of setbacks. Space is also key in maintaining an efficient environment for forklift operation. That doesn’t simply refer to the square footage of the warehouse. It’s possible to have a very large facility with little operable space. The idea here is to provide as a wide of a path as possible for your forklift operators. One easy way to do this is to keep all stored products and packages up against a wall. If your inventory and/or space limitations require the construction of aisles, then make sure you have plenty of space between rows for a forklifts to maneuver without being cramped. The width between aisles will largely depend on the type of forklifts you are using as models vary in terms of turning radius, elevation and reach. Once you’ve identified the forklift models in your warehouse, construct your aisles accordingly. This will not only speed up work flow, it will also go a long way in avoiding accidents..
Width between aisles isn’t the only important consideration in the layout of your aisles. Logical and proper labeling is also key. As much as possible, try to stack items of a similar kind or category in the same aisle, and make sure each aisle is clearly labeled so employees know which items can be found there. This will avoid hours of confusion and backtracking that can result when employees are not sure where to find specific inventory items. Creating short cuts through aisles can also help to streamline storing and delivery. Putting gaps in the middle of aisles will allow employees to make a direct a path to the items they need without having to walk or drive forklifts around entire aisles to get there. Another way to propagate both speed and safety is by regularly maintaining the warehouse floor. Pot holes, cracks and debris are all hazards to a forklift. They will slow down the work rate as operators are forced to avoid them, sometimes even needing to stop and reverse course to do so. But they can also cause more than timing inconveniences. Uneven surfaces can cause forklifts to teeter and even fall over, resulting in expensive repairs to both the forklift and its cargo. Such instances can also result in employee injury. So it is imperative to keep a clean, even floor in the warehouse. Many layout considerations that promote forklift efficiency might seem obvious, but they are no less important. Making sure forklift operators have a safe and efficient work space is a great way to boost production and prevent losses.